The NEW Galaxy Note 10.1 houses 2 GB of RAM. ablet is the new concept for all-in-one media device that will enhance your productivity, creativity and learning capabilities and all this potential on one ultra-portative screen. Actually its portability can be described best as follows: 262x180x8.9mm dimensions, only 8.9mm thickness and a weight of 600 g. And don’t even get me started on the flexibility of the Galaxy note. 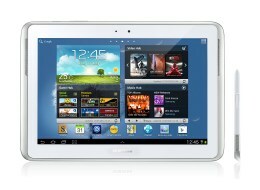 Office, home, school no matter where you need it, the Galaxy note is there for you: fast, comfortable and intuitive. What we found pretty cool about its appearance are the built-in stereo speakers on the two sides of the display and we weren’t disappointed by any means by the sound that comes from them. The design is beautiful, the plastic cover along with the smooth lines and curves makes it look quite sleek. The silver line that runs along the front edges also contributes for its elegancy. What we found pretty cool about its appearance are the built-in stereo speakers on the two sides of the display and we weren’t disappointed by any means by the sound that comes from them. It’s quite clear and loud enough too. The interface is very easy to use and the interactive keyboard is big enough to even meet the needs of the people with big hands. Unlike the Samsung galaxy tab 2 10.1 that actually looks very similar to this one, here Samsung have featured an S pen stylus that you will find very handy especially if you are an artist, because it provides much better accuracy and control over the display. The interface is very easy to use and the interactive keyboard is big enough to even meet the needs of the people with big hands. 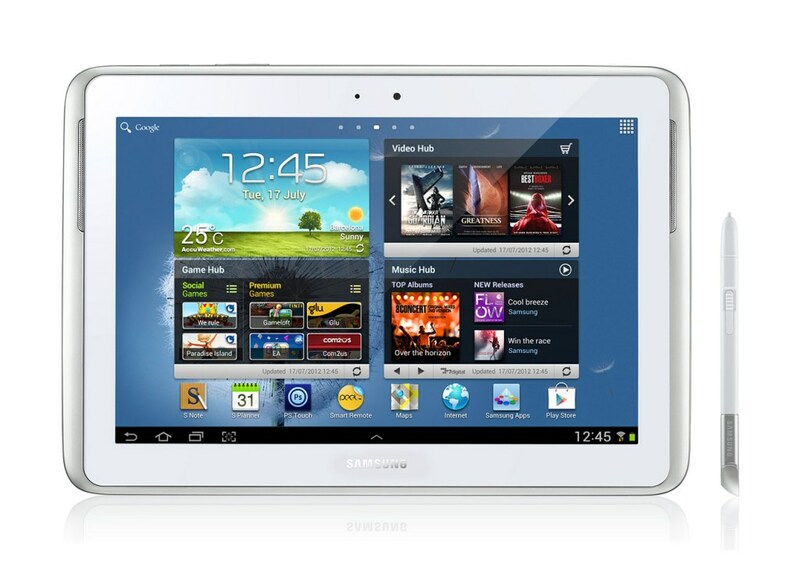 With Galaxy Note you will enjoy real multitasking on a highly portable 10.1’’ screen. It is WXGA LCD touchscreen display with 1280×800 resolution. The “Multiscreen” feature gives you the flexibility to write down your ideas and memos while at the same time browsing the Internet. You don’t even need to pause the movie or the browser to surf the web or create a quick note. The opportunity to split the screen in two where different applications that can run simultaneously on either side is one of the best features of the interface. Note comes in 16/32/64 GB of user memory while the operating RAM that the device houses is 2 GB. You have three options when it comes to memory, the Galaxy Note comes in 16/32/64 GB of user memory while the operating RAM that the device houses is 2 GB. But the best news is still to come, and yes, you have a microSD slot that allows you to expand the memory of the Note even further. Along with that on the upper edge of the device you will find a power button, a volume and brightness controller and an IR blaster, a SIM card slot and a headphone jack and on the bottom edge we find the dock connection port. The 1.4GHz Exynos Quad-Core processor runs the Android 4.0 Ice Cream Sandwich platform and provides pretty fast overall performance and an immediate response the second you lay your finger or the stylus on the screen. The base camera is rear with 5 MP and also auto focus and an LED flash are featured. Personally I have always felt weird taking a picture with a tablet, it just doesn’t feel right. But for video calls a camera is never useless. With Samsung Galaxy Note 10.1’’ you even get two. The base camera is rear with 5 MP and also auto focus and an LED flash are featured. The second Sub camera that is front-facing with 1.9 megapixels. As far as battery performance goes Samsung claim about 9 to 10 hours of battery life but we would add “provided that you don’t keep the screen on for too long and also avoid too much multitasking”. Use the Adobe Photoshop Touch to create, edit and share images. Now it’s easier than ever because the editing is extremely precise, using the handy stylus. Among the other applications you will find on the Samsung Galaxy note are Kno for downloading textbooks, Polaris Office, ChatOn, Dropbox, Music Player and Game Hub.